University of Texas Rio Grande Valley students swim in a cenote, an underwater cave that serves as a main water source. 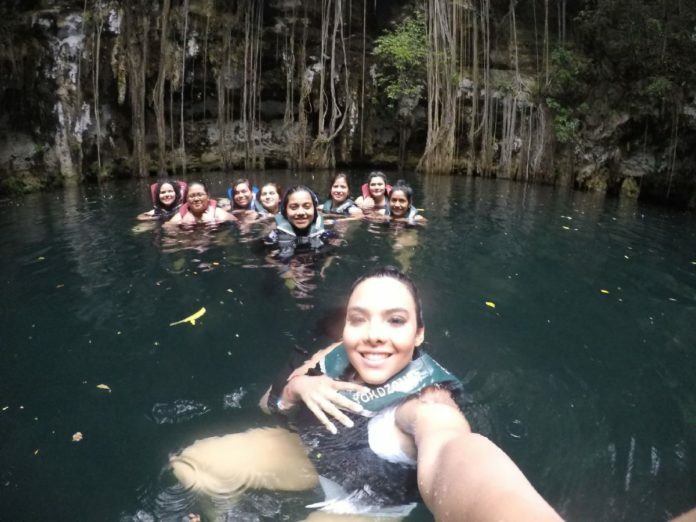 Nine University of Texas Rio Grande Valley students spent a week in Mérida, on the Yucatán peninsula in México, as part of a study abroad trip focused on global change. The bilingual course — led by Teresa Patricia Feria-Arroyo, associate professor of biology in the UTRGV Department of Biology, College of Sciences — was in Mexico from July 1-8, visiting locations that highlighted the area’s natural assets, with an emphasis on how tourism has helped preserve the environment. The group met before its departure to go over the topics they would be covering and to learn about the Mayan Yucatán. “The main topic of this class is global change, so we studied how human and oceanic activities have changed,” Feria-Arroyo said. “I wanted them to have an idea of how our ecosystems are not exactly similar but equivalent with what we have in the Valley, and of our expectations of a high-volume tourist area. When picking a location for the study abroad course, Feria-Arroyo said, she looked for a safe location with a similar ecosystem to the Valley’s, but also one culturally relevant. The concept was to compare what the indigenous Maya do today to preserve the area, versus what is done in the United States. Feria-Arroyo said the experience of being able to observe first hand resonated with the students. Another reason for choosing Mérida was the prevalence of indigenous Maya there, which Feria-Arroyo saw as a way for her Hispanic students to find pride in their Mexican roots.